Support the CPA in Springfield! On November 8, 2016, voters in Springfield will have the opportunity to support the Community Preservation Act. If passed, this will set up a fund in the city dedicated to Historic Preservation, Open Space/Recreation, and Housing. 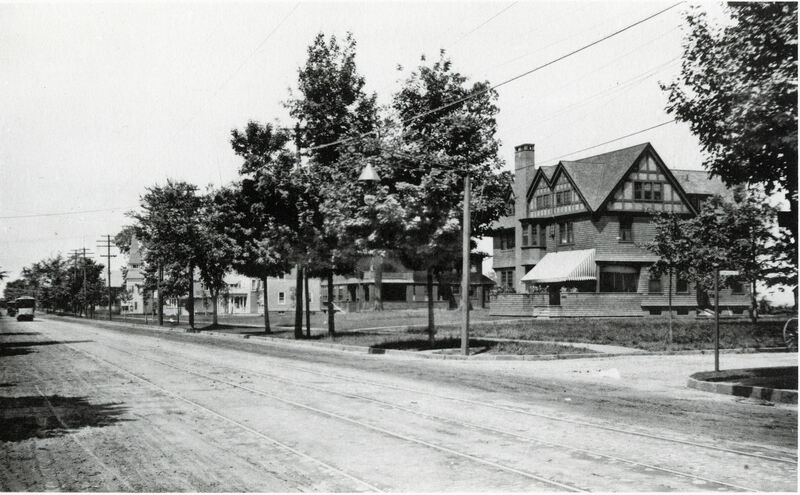 Historic Preservation has taken a back seat in the city for far too long. We have a tremendous amount of historic properties, but many are neglected, and have been neglected for decades. Unfortunately, Springfield has had perennial budget constraints for decades, and historic preservation is always put on the back burner in favor of things like public safety, employee raises, and even deferred pension liabilities. The CPA would create a separate stream of revenue from a small 1.5% surcharge on property taxes. For the average house (valued at $134,806), it comes to approximately $10 per year, or less than $1 per month. When everyone contributes, this raises a total of $1 million per year, and this triggers a state match which can be up to 100% per year (though in 2015 the match was about 29%). I encourage every Springfield voter to vote yes on Question 5, for the CPA! I came across an article in the Springfield Republican, April 21, 1957. At this point in time, the Magnolia Lions were no longer in existence, and in fact, people were remembering them with nostalgia, so they likely hadn't been around for a while. Lately, I have tended to only write blog entries when I am wowed by something, and lately, nothing has wowed me. 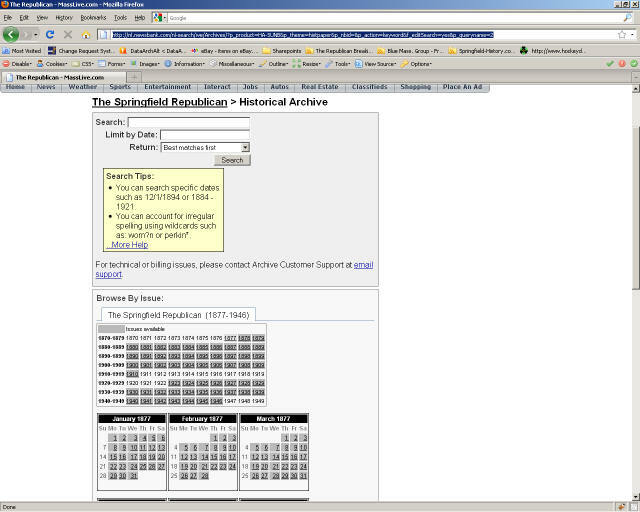 But today, I realized that the Massachusetts Cultural Resource Information System (MACRIS) has digitized its historical inventory files and is making them available to the public. What wowed me was a photo of the West Union Street school, taken in the 1970's. The building is no longer standing, and I had never seen a photo of it before. I am doing some research on this venerable piece of land and am trying to figure out when the names were changed. This is what I know. Every now and then I come across photographs which are marked as being from Springfield, but upon further research, they are not. They are either from another state's Springfield, or sometimes are from another town in the region. I thought that would be the case when I came across this stereoview, marked "North Church", published by Milton Bradley & Co, Springfield. 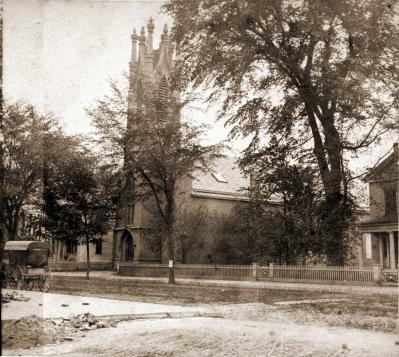 I didn't recognize the church, and to me, "North Church" was the church that sits on the corner of Salem & Elliot Streets. Still, the identification wasn't written in pencil -- it was printed on a label affixed to the card, so I went ahead and bought it, puzzled as to its location. Someone asked me when schools were built in Springfield, so I decided to consult some prior research that I had compiled. 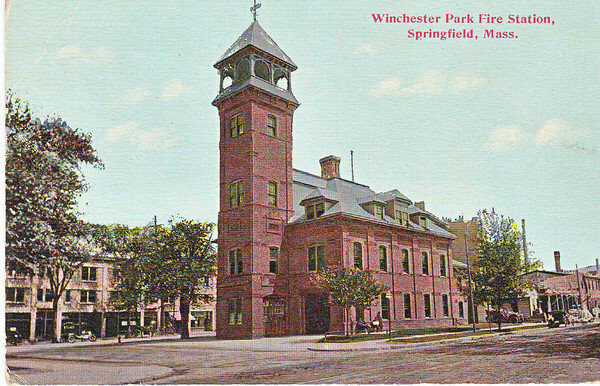 When I looked at the list of Springfield Schools that stood in 1900, I was surprised at just how few of them are still standing. Of the approximately 40 Springfield Public Schools that existed in 1900, just 10 11 remain standing -- 75% of them have been demolished. Update: Springfield Historical Commissioner Bob McCarroll has told me that I missed a school -- Alden St. School, which was converted into a church. I was confused because the school was built in 1890, but the city had the building present on the site listed as being built in 1910. 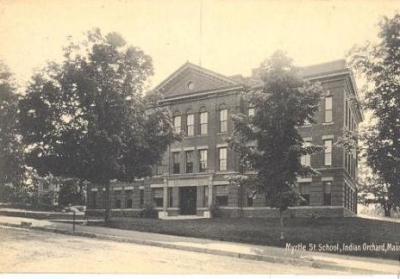 Only one school stands from Springfield's first school building boom in the 1860's, only 2 schools from the city's second school building boom in the 1880's stand, only one single-room ungraded school still stands, and only two schools from the 1890's stand largely unmodified. Here are the ten eleven schools, ordered by year of construction. 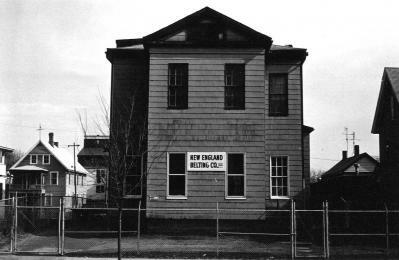 Built in 1868, this is Springfield's oldest standing school, although it has been significantly modified to the point where it is unrecognizable from its original design. 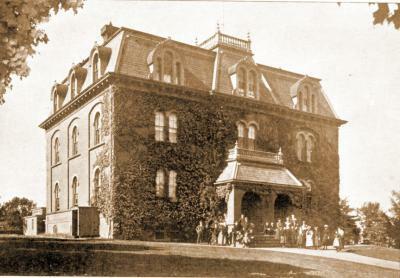 It was renamed Myrtle Street School and the original school had another building built in front of it. Then a second building was built in the front, a twin of the first. The school was later converted into housing, I'm not sure when. There is an exciting new development for people interested in researching Springfield and Springfield-area history: The Republican has digitized many of its back issues and is offering them online on a subscription basis.